It is bucketing down outside this afternoon and I am feeling rather cosy inside out of the rain. After taking the photos for this blog post I had a bowl full of this hot, delicately spiced warming soup. Seriously delicious and quite filling, owing to the yogurt, potatoes and mooli. Now that Autumn is well and truly here this soup comes into its own and I urge you to try making yourself some. It was Durga Puja last weekend – you can read up what goes on exactly at this Indian celebration in my posts from last year and the year before see here and here. During the festivities at the Hindu temple prasad is often taken. 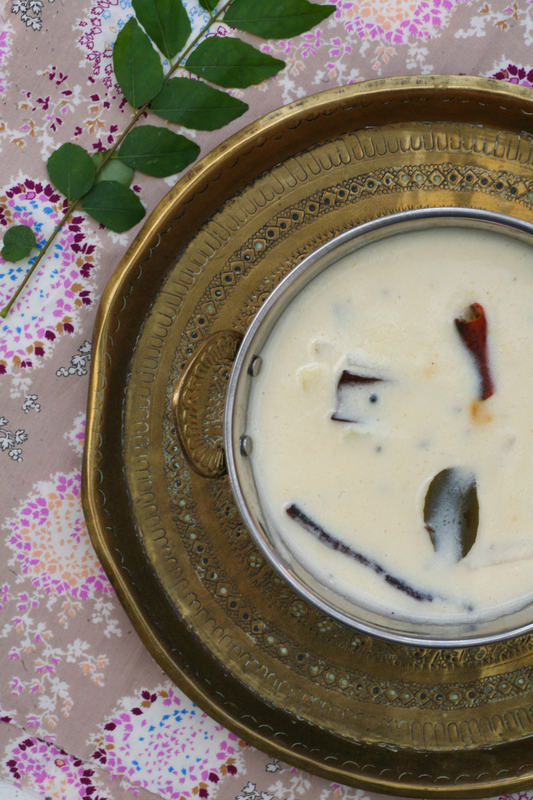 Prasad is literally a religious offering or gift that comes in the form of a meal. Always vegetarian and gently spiced it allows families and friends to come together to share a meal that is blessed during this auspicious occasion. 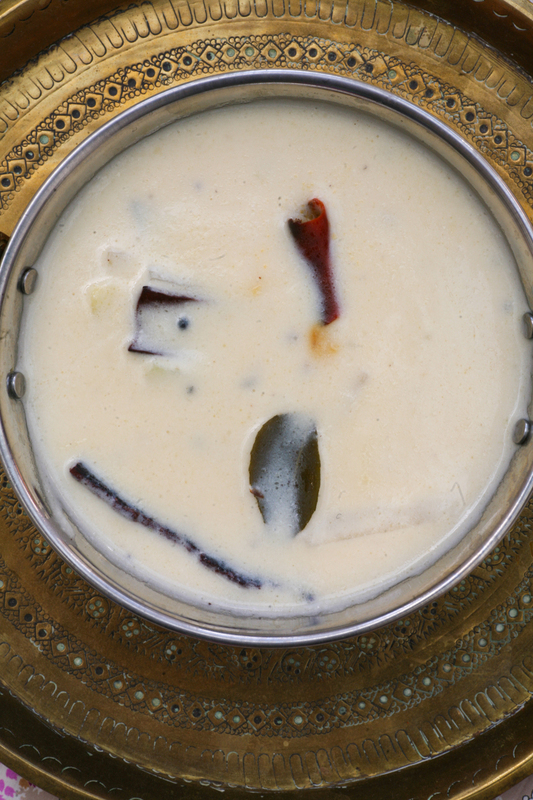 One of the curries we were served was this Gujarati Kadhi. I adored the delicately spiced yogurt soup so much so I was allowed to venture into the kitchens to see how it was being prepared. Huge caldrons of the soup were being constantly stirred over hot stoves before being taken out to hungry worshippers. I’ve made my own additions and twists but the taste is pretty similar to the one that I had last weekend. It is so different from any soup or dal I have tried before that it immediately appealed. All the ingredients are pretty easy to pick up at your local supermarket. I have seen gram flour in the big supermarkets here in the UK and I noticed that Waitrose was even selling fresh curry leaves the other day. Times are changing! Mooli is harder to track down if you don’t live near an Asian grocers so just omit that part if you can’t find it. As with most of my recipes it is quick and easy so if you are feeling adventurous then give this fabulous dish a try. 1. In a large bowl mix the yogurt, gram flour, green chilli and ginger paste, salt and water using a hand whisk. 2. 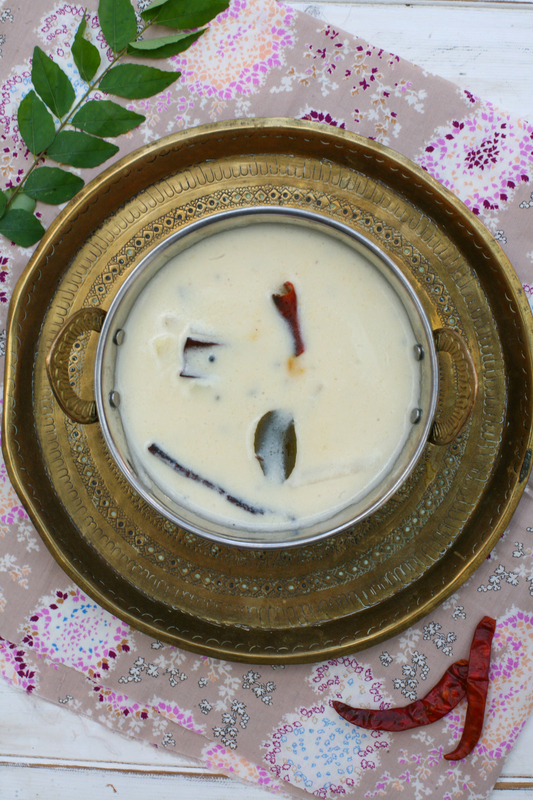 In a deep saucepan add the ghee and when it is melted add the mustard and cumin seeds and after 30 seconds add the cloves, cinnamon sticks, dried red chillies, fresh curry leaves and asafoetida. This is known as tempering. 3. Add the mooli and potato matchsticks and stir into the spices for one minute. 4. 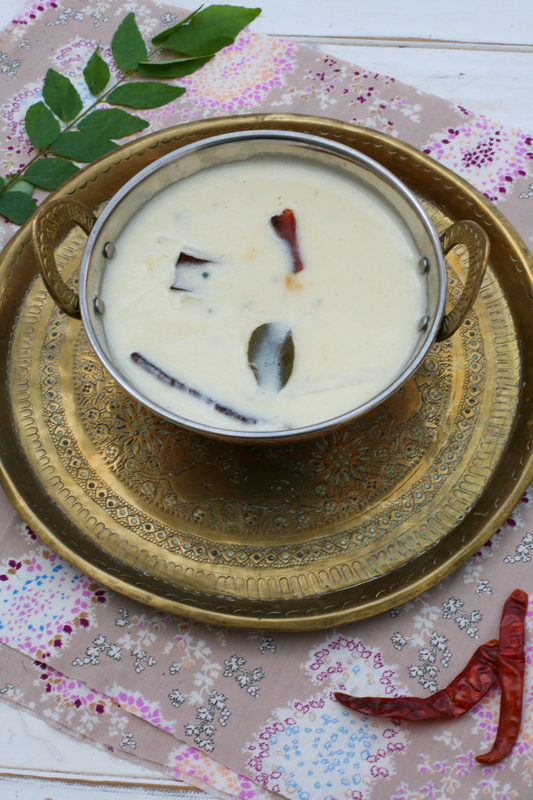 Gently pour in the yogurt/gram flour mixture over the potato, mooli and tempering spices and stir continuously to prevent the yogurt from separating. 5. If you find the mixture too thick simply add a little more water. 6. Add the jaggery or sugar if you don’t have any jaggery to hand. Stir into the soup. Simmer for around 15 minutes or until the potato and mooli matchsticks are softened. Serve with basmati rice or simply on its own in a bowl. This entry was posted in Away Days, Soup, Vegetable, Vegetarian and tagged celebration, dal, durga puja, gujarati, india, Indian, kadhi, soup, temple. Bookmark the permalink.